Keeping up with current events is hard enough, but keeping your wardrobe up with current events is almost impossible, unless you know someone who can loan you a Reelect McChrystal tee. What, you don't know what that means? Keep up with current events, man! For gear doing just that, check Hot Press Tees. The brainchild of a fashion industry vet & a longtime media publicist, HPT's aiming to "fuse the worlds of media and fashion", going so far as to add one tee per week inspired by an event that dominates the headlines (so hopefully somebody tells Lindsay Lohan to SCRAM). Recent drops include The Gooch Can't Hurt You Now, featuring a halo'd Gary Coleman; The Crude Behavior, with a green BP logo sun beaming down on a giant, Asian-woodcut-esque black wave; and Kobe Beef, with loads of meat stuffed into the Mamba's #24 jersey, clearly filling in while Kobe drills for his own oil. Dipping deeper into the past, there's Radical Islamic, with a Muslim dude throwing up an aloha sign & popping a wheelie; The Salty Muffin, in which Betty White gets the "Warhol treatment"; and the plane from the License To Ill cover helmed by Kim Jong, who doesn't want you to fight for your right to political party. 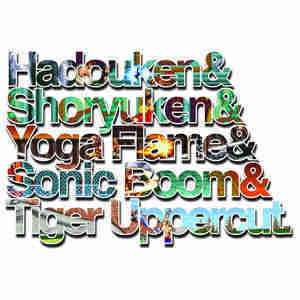 They've also got a collection of only-occasionally current takes on the ubiquitous "&" design, including the Hadouken & Shoryuken & Yoga Flame & Sonic Boom & Tiger Uppercut (each filled in with a screen shot of said move), and the uniform-colored Hulk & Andre & Studd & Roddy & Snuka -- unless you know someone who can loan you their leopard thong, it's probably the closest you'll come to looking Superfly.